An intensive three-day skills-based course, Grand Action Regulation in 37 Steps will help you polish your skills in grand regulation and ensure that your clients' grand pianos are performing at full potential. 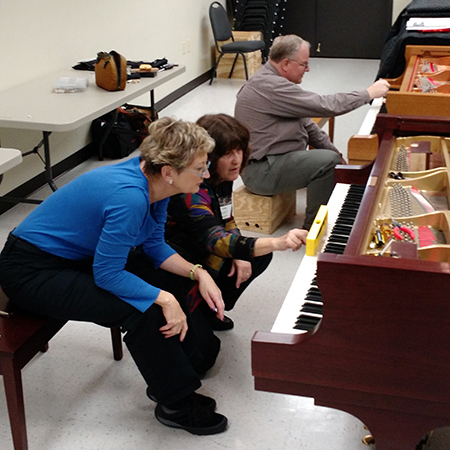 Based on curriculum from Yamaha's "The Little Red Schoolhouse," participants will benefit from personal pianos, small group instruction and individual feedback. You will learn how to increase action control, even movement, maximize the dynamic range and achieve the fastest speed of repetition available. 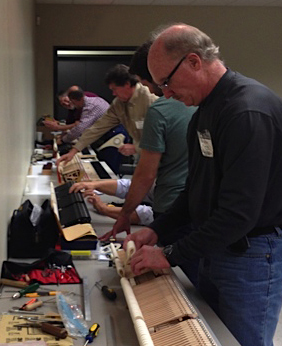 The course includes detailed demonstration and explanation of the 37 steps method of regulating a grand piano alternating with guided practice on each step. Successful participants will pass a final regulation skills assessment at the end of class. You'll enjoy your stay at our preferred hotel, the newly-remodeled Drury Inn Shawnee Mission. Features include free wireless internet, hot Quickstart breakfast, evening Kickback with hot food and cold beverages, free parking, in-room coffee service, microwave, refrigerator, flat panel LCD TV, 24 hour business center, 24 hour fitness center, and more. Great discounted PTG rate! Classes are scheduled all day Thursday - Saturday with a final session on Saturday night. PTG provides transportation between the Drury Inn and the PTG Home Office each day. We have a special discounted rate with the Drury. You'll receive reservation information with your class confirmation. The nearest airport is Kansas City International (MCI), about 30 minutes from the PTG Home Office. Taxi • Courtesy phones are located at convenient spots throughout terminals. Uber also serves Kansas City. The PTG Home Office is located in Kansas City, Kansas conveniently close to interstates I-635, I-35 and I-70. The Drury Inn Shawnee Mission is located about three miles from the PTG Home Office at I-35 and Shawnee Mission Parkway in Merriam, Kansas. Download a map. Online: Sorry, the spring 2019 class is sold out! Watch for fall 2019 dates. By mail: Download a registration form. Questions? Contact Kathy at 913-432-9975 or kathy@ptg.org. Visit the online PTG Academy at my.ptg.org. Interested in hosting an Exam Prep on the Road? Contact Kathy Maxwell, 913-276-5202 or kathy@ptg.org. Interested in teaching a multi-day class at the Home Office in Kansas City? Copyright © 2018 Piano Technicians Guild. All rights reserved.